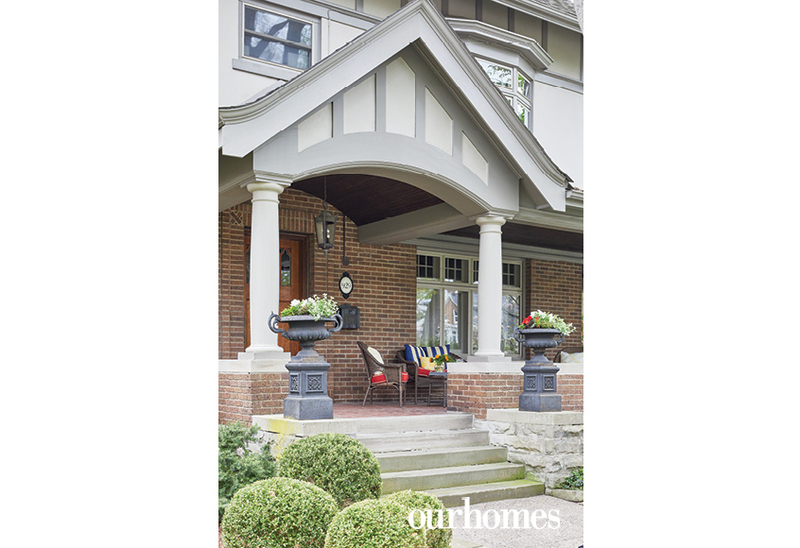 Stately 1919 home in London's Old North neighbourhood gets up-to-the-minute yet respectful update. A version of this article originally appeared in the Summer 2018 issue of OUR HOMES London and Middlesex County, p.12. Find local businesses in our London directory. 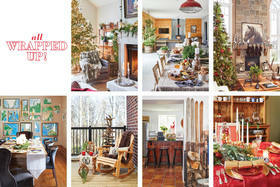 Collin Johnstone has been reading interior design magazines since he was 12 years old. So when his father, Ian Johnstone, purchased a stately home close to campus for Collin and his sister to live in while they attended Western University in London, Ontario, it was only a matter of time before he put his stamp on the space. Built in 1919 for the Catholic Diocese of London, the 7,400 sq. ft. house retains the grandeur of years gone by with its expansive main floor living room and sun room, formal dining room and a sweeping staircase. 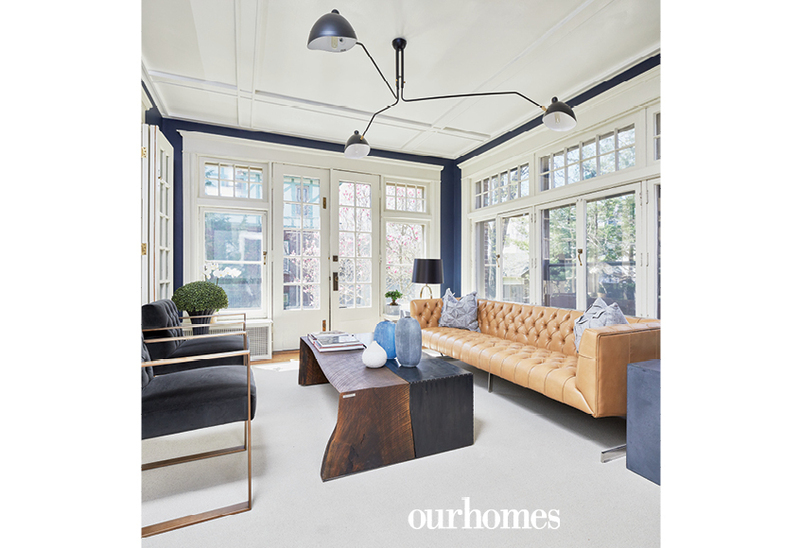 Original wood flooring, leaded windows, tall baseboards and pocket doors add to the home’s understated elegance. 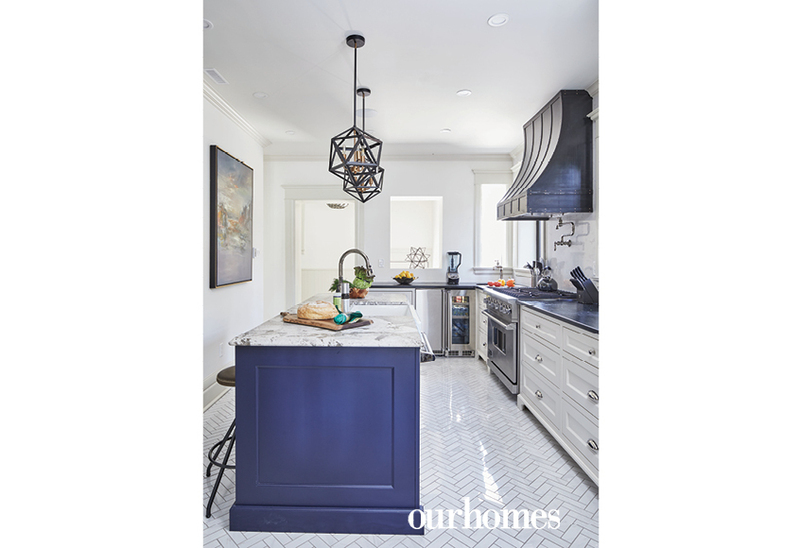 DUO Building Ltd. was brought in to oversee the kitchen and bathroom renovations, while Collin worked with Sylvie Roth of Sylvie’s Interior Design on lighting and some wall colour choices. Collin believes the home’s kitchen had not been touched for several decades. Relocating the refrigerator and removing the upper cabinetry from along the back wall facilitated the creation of a stylish bar area complete with an icemaker and beverage fridge and round copper sink by Native Trails from The Ensuite Bath & Kitchen Showroom. 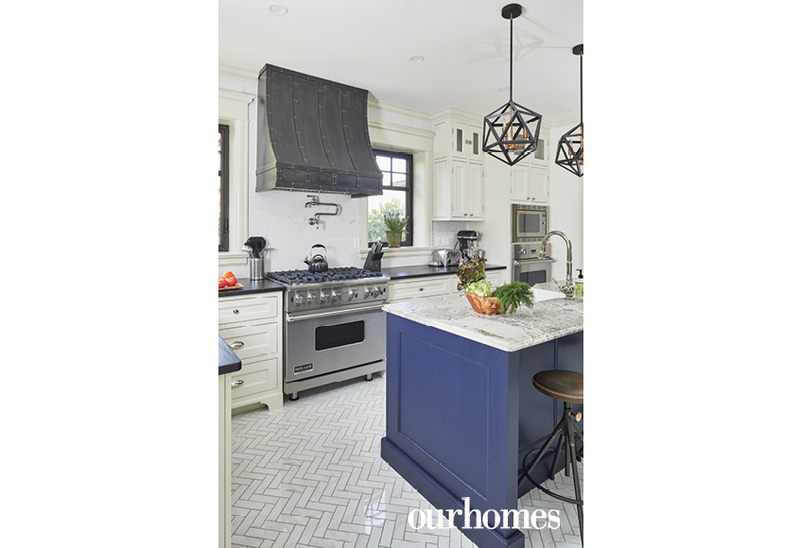 The kitchen’s large centre island, painted a surprising shade of navy blue (Old Navy by Benjamin Moore) and topped with an ice white leathered granite countertop, provides plenty of space for prep work, as well as a comfortable spot for casual dining. A cast-iron farmhouse Kohler sink (The Ensuite) and porcelain herringbone flooring (Alfred’s Carpet One Floor & Home) complete the room’s vintage vibe. “Some people thought the kitchen would have too many design elements, but when they see it now they are quite impressed,” Collin says. 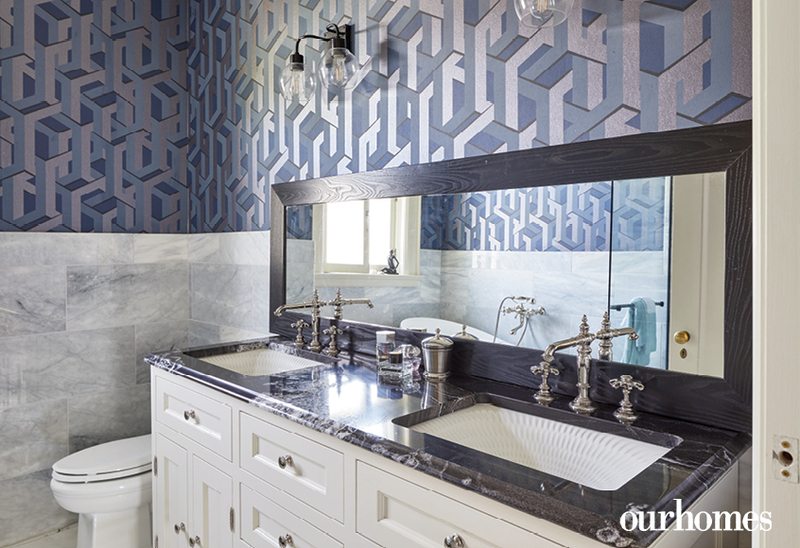 Collin’s love of texture and contrast is on full display in the nearby powder room. The small space makes a big impact thanks to bold geometric wallpaper from Clancy’s Rainbow. Roth Design Inc. created a custom vanity using a clever mix of concrete, teak and galvanized steel. It provides the perfect pedestal for another Native Trails copper sink. Upstairs, DUO expanded the existing bathroom by removing a closet from an adjoining room and stealing space from the large second-floor landing. This clever solution provides plenty of room for a double vanity, claw-foot tub and large walk-in shower. Collin was so taken by the powder room wallpaper that he chose a slightly different version for the upstairs bathroom. “This bathroom has a masculine, mid-century modern feel that I really like,” he says. In combination with Calacatta marble flooring and dark granite countertops, it makes a dramatic statement. 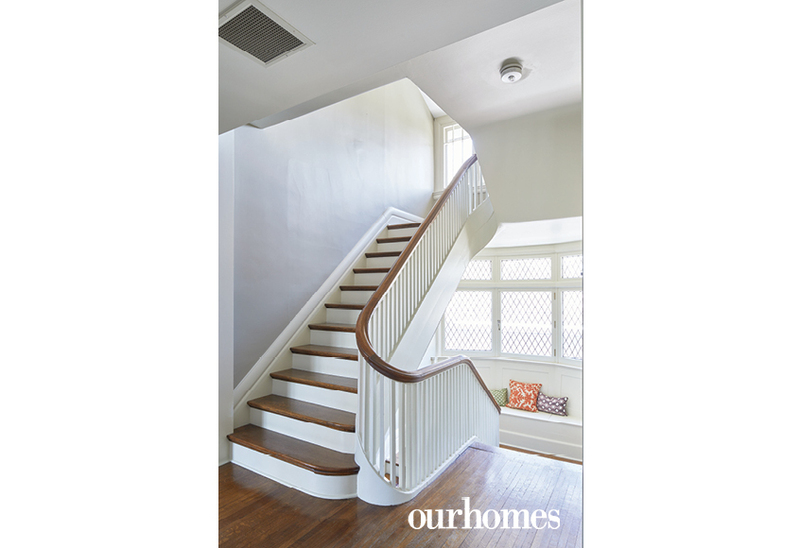 With the kitchen and bathroom renovations complete, Collin is turning his attention to the home’s third floor where DUO will oversee the transformation of the former servants’ quarters into a private master retreat. “We’re going to take down all the walls to completely open up the space,” he says. One of north London’s most venerated homes has always been a head turner, its gracious covered porch providing shady respite from the summer heat. Collin Johnstone, DUO Building Ltd.’s Gayle White-Malloy and Ian Johnstone. 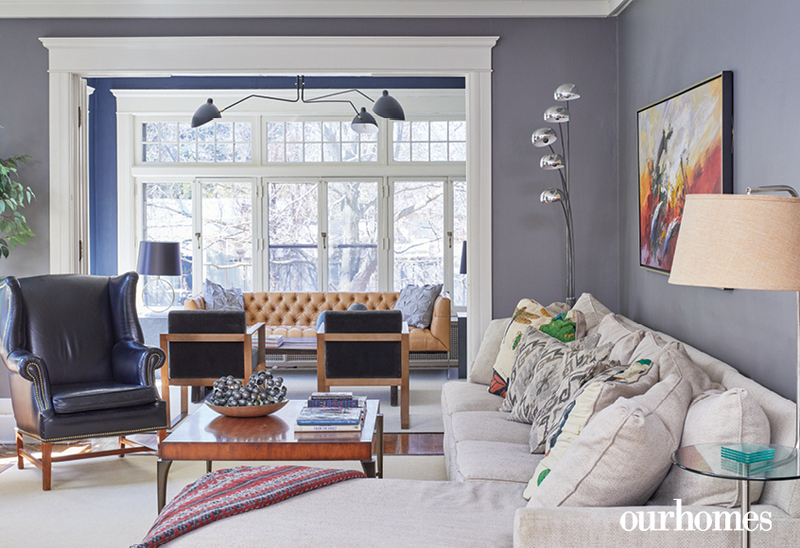 The home’s original architectural features enhance the living room. A large cosy sectional sofa in the living room has modernized the room’s purpose, making it a welcoming place to relax or watch TV. With the living room and sunroom open to each other, light streams through the house all day. The sunroom overlooks the back garden, providing access from french doors. 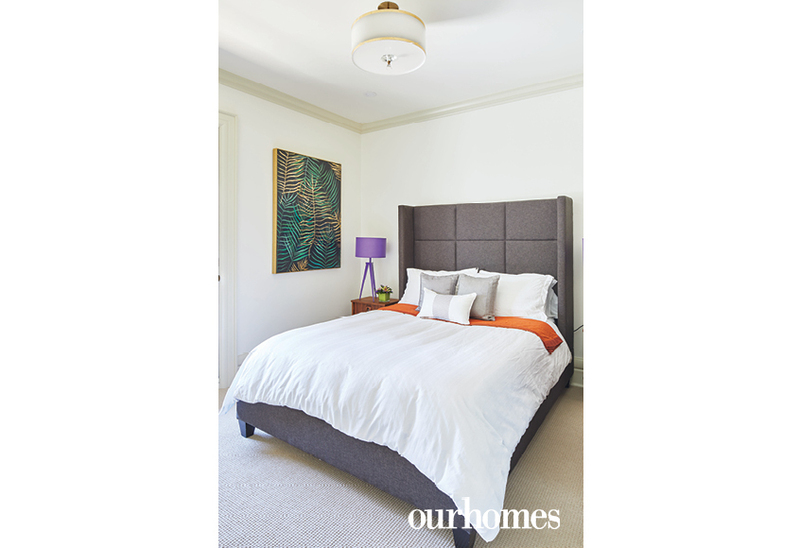 Contemporary furnishings, a coffee table by Roth Design and a leggy metal ceiling fixture are surprise elements. The dining room opens from the home’s centre hall. A bold new chandelier and angle iron mirror work beautifully with the traditional dining suite. The renovated space flows seamlessly thanks to the removal of a dividing wall, which has been replaced by pocket doors. The reconfiguration of space delivered a stylish and functional layout. Custom face-frame cabinetry gives the kitchen a contemporary feel while maintaining the integrity of the home’s traditional style. Face framing is a visual feature typical to homes of a certain era. It adds strength to the cabinetry because the frame provides a place to attach doors and hardware. A custom steel range hood with copper nail accents designed and built by Roth Design Inc. provides a striking focal point and sits above a six-burner gas Viking range. 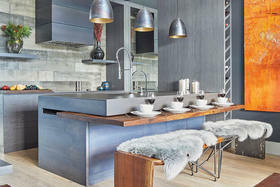 Black soapstone counters are offset by a grey quartz backsplash that continues right up the walls. 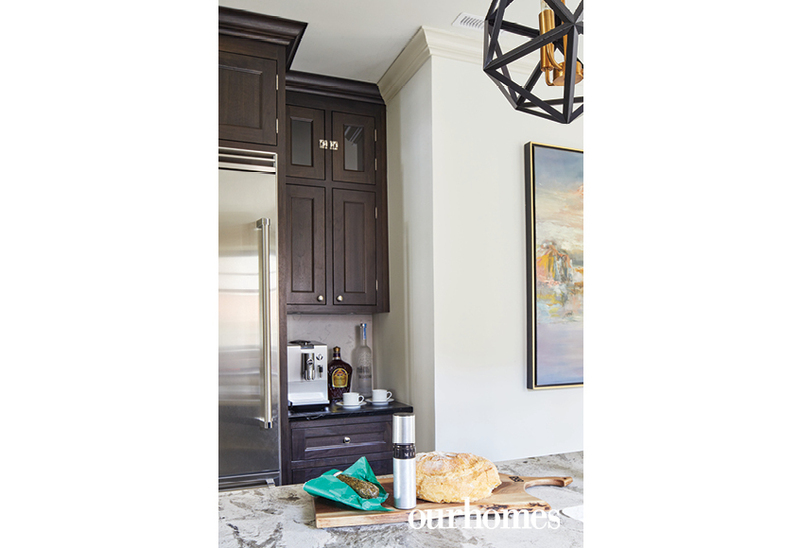 A handy beverage centre tucks into an alcove beside the fridge. 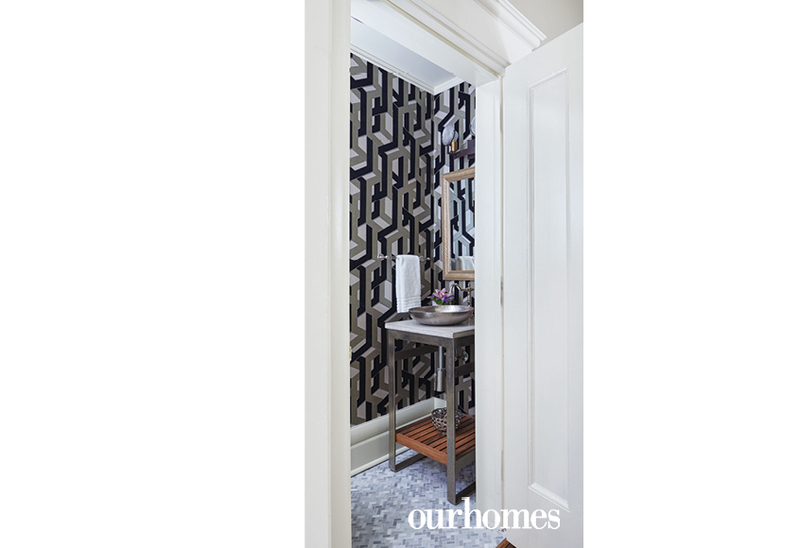 The tiny powder room involves a sophisticated interplay of geometric wallpaper, herringbone floors and a custom teak, steal and concrete vanity. 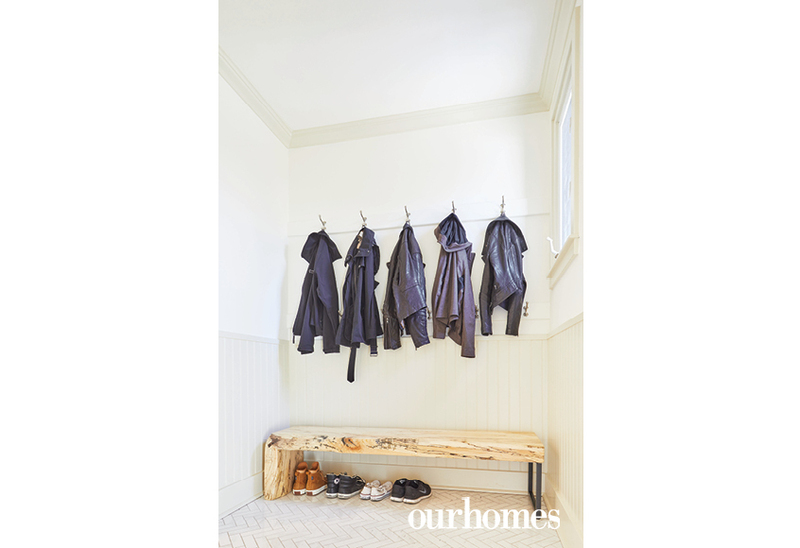 DUO created space behind the kitchen for a spacious mudroom. Simple hooks and a custom bench offer easy, stylish storage. The centre stairwell, with original leaded windows and bench seat, rises to the third floor where round two of renovations is about to begin. One of several bedrooms on the second floor gets a sunny update. The second floor required some reconfiguring on DUO’s part to allow space for a generous, luxuriously appointed bathroom. 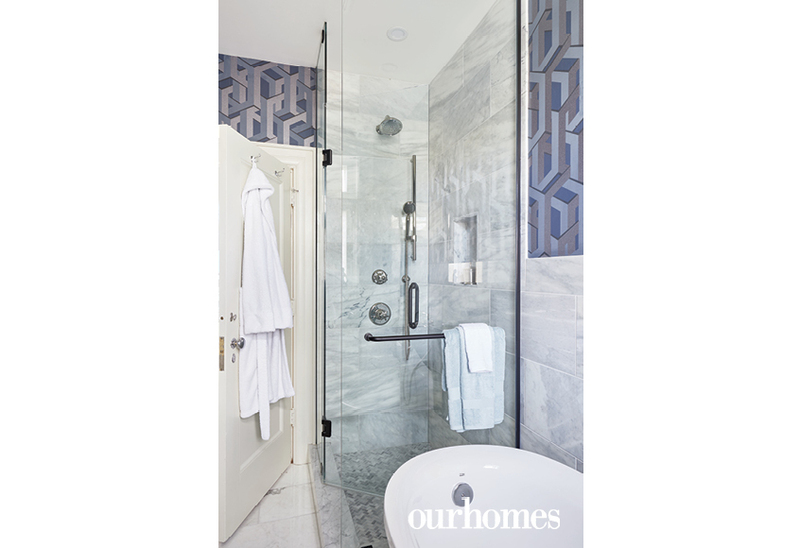 As in the kitchen, Collin wanted the up-to-the-minute spa bathroom to connect stylistically with the original house. 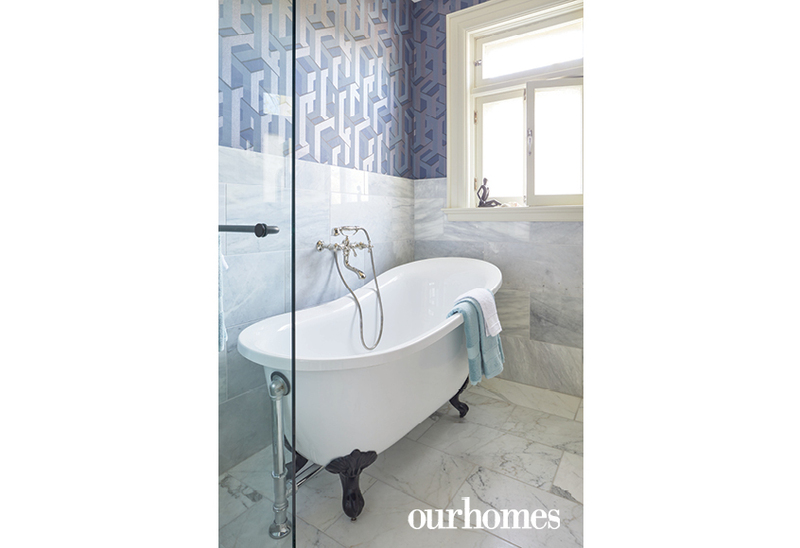 Features like a claw-foot tub and period faucets fit with the era of the home.